Zoe Sahloul is a passionate advocate for inclusion and social integration of Arabs and other Muslims living in Maine. Born in Beirut, Lebanon, Zoe immigrated to Canada in 1992 to escape the civil war and to find peace and safety. 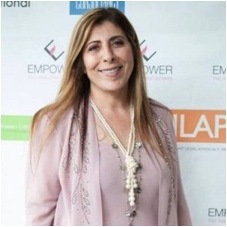 She is the founder and president of the New England Arab American Organization (NEAAO), a group whose mission is to help ease the integration of Arab immigrants into American society and bridge the gaps between cultures. In addition to serving as a board member for several organizations, Zoe currently partners with a variety of groups including 'Through These Doors,' Westbrook Police Department, Westbrook Community Center, 'Portland Empowered,' and Westbrook School Department to support marginalized Arab communities. Zoe is also focused on creating avenues for new Arab immigrants to engage in their communities by establishing collaborative connections to create more opportunities in the workforce. She is a strong and passionate advocate for women’s rights and justice, children’s rights and protection, education, and a leading voice for immigrant social integration and racial equity in Maine. Zoe also served as the founding board chair of the Maine Immigrant Rights Coalition. Zoe will be focusing her talk at Portland Rotary on the work of NEAOO and their efforts to support New Mainers.